Scouts don’t care if you go 4-4 or 0-4. They wan’t to see bat speed. They don’t care if you hit an extra base hit. They want to see you drive the ball with authority. Don’t worry about being too selective either. Scouts need to see your ability to show plate discipline while being aggressive at the same time. If a scout is in the stands watching you perform, you don’t have to worry about production. Can you run the bases correctly. Take quality hacks and at bats? These are things that are within your control. Being prepared, and giving effort while showing some baseball smarts is all you really need. They want to see how you do that to. Can you handle failure with poise? 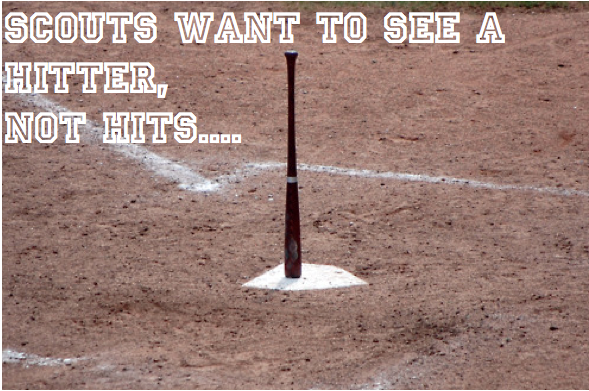 Or do you throw your bat? Do you press in clutch situations or do you play they same with nothing on the line? Not whether you produced but whether you performed. Scouts want to see the silent victories. Those are the hitters that can play at the next level. The kind that gets paid to play every day.